Lamy fountain pen ink suitable for all Lamy fountain pens. Supplied in boxes of 5 cartridges. The product is always good and from the pen company, it is always so much cheaper then on the high street. They always give a great service too. So much easier to order these online with quick delivery. A lovely colour. Subtly different to the usual blue. I love it! And the delivery is so fast. Need more ink for school pen. Best price around, next day delivery and well packaged. 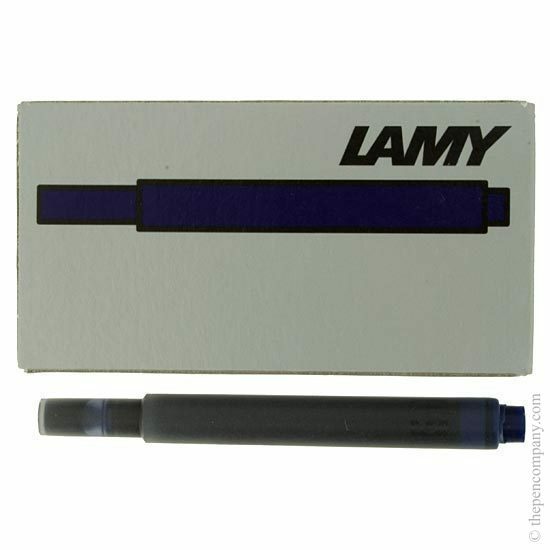 Genuine Lamy washable blue ink which washes out of blouse cuffs easily. Great price, great service .... I will use the company again. I received exactly what I ordered due to the clear website and the prompt service of the Pen Company. Easy purchase. Quick delivery. Would certainly recommend your company. I have ordered Lamy cartridges from a number of suppliers over the years, but The Pen Company is easily the best - next day service every time. I'm a confirmed loyal customer! Thank you for the efficient delivery of my Lamy cartridges. I use my Lamy italic pen every day and didn't want to be without ink! Same day despatch; next day delivery. Brilliant. Great pens, love the purple ink! I have several, different sizes of nib, one for every situation. There's nothing much one can say about an ink cartridge! However, I ordered the cartridges one day and got them the next - what a service. Brilliant. Next day delivery - what more could I ask.